While the holiday season may be over, toy makers are already focusing on 2008's hottest buys. 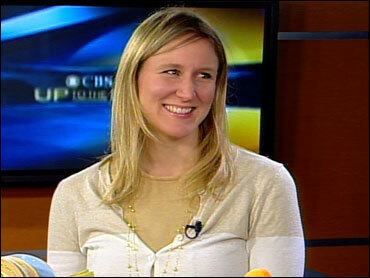 Jessica Hartshorn, Sr. Lifestyle Editor for American Baby Magazine, shows some great finds from this year's Toy Fair. With all the toy recalls in 2007, many manufacturers are offering "greener", more eco-friendly alternatives to shoppers this year. "I saw a lot of wooden toys being shown," says Hartshorn. If you're still worried about lead paint, look for water-based stains and soy-based ink. Also, many toy stores are still displaying signs that indicate what country each toy was made in. You may want to take the place of origin into consideration when making toy purchases this year as well. Toy companies are also focusing more on interactive, physical toys this year. Last Christmas, Fisher Price introduced their Smart Cycle that encouraged kids to ride a stationary bike in order to play a video game. Similar toys are all over the place this year, including ones for toddlers who are just learning to walk. "As soon as you stand up, you should be walking around. No more sitting in front of your videos," says Hartshorn. Many companies are also celebrating big birthdays this year, and in turn, offering special edition toys. For example, stuffed animal manufacturer Gund is turning 110 and everyone's favorite purple dinosaur, Barney, is turning 20. Legos, another childhood favorite, is turning 50. "They're going to have this 50th anniversary set with a magical gold brick this year," says Hartshorn. For more information on toys for your child, as well as more parenting advice, click here to visit AmericanBaby.com.